Shoppu, an e-marketplace project by AEON has recently done a survey in early 2016, on consumer online shopping behaviour. It is an interesting sample as 80% of the survey entries are AEON members, which means we get to see the typical local consumer trend here, compared to sampling geared towards Internet users. Do take note too that 72% of the respondents are female, full demographics is enclosed at the end of this article. Let's start with the highlights first! Jump straight to full infographic here! In contrast to various reports that 90% or more (online) consumers are shopping online, Shoppu has reported that as high as 25% are shopping at offline stores only. Imagine if we have a balance mix of online and offline consumers sample, the percentage of local populations who do not shop online yet could be even higher. In any case, this represents untapped markets for e-commerce players with many are still shopping at offline stores only. The question being asked here is "What product categories are you interested in?" 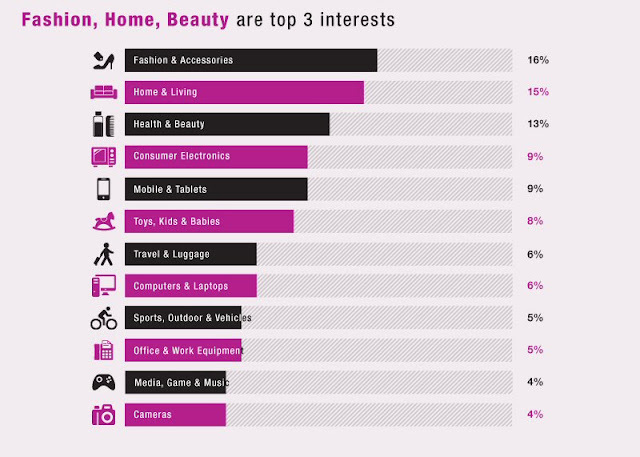 and Fashion & Accessories, Home & Living, Health & Beauty are the top 3 categories. Bear in mind that the respondents here are skewed towards female in majority, therefore male-driven categories like Consumer Electronics, Mobile & Tablets are trailing behind. In any case, it is interesting to see Home & Living climbs above Health & Beauty here, similar to the category shift shared by Lazada earlier. We are always curious what kind of promotions mechanic works the best, and to no surprise consumers prefer coupon discount the most, far ahead the rest. 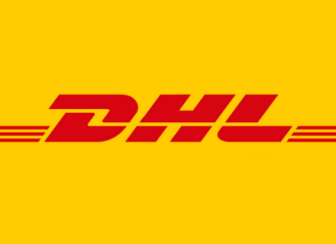 Free shipping, loyalty points, flash sale ranks second to fourth in "What kind of promotions attracts you the most?". It is interesting to see that three of the top four promotions are skewed to online (or online only), with GWP and PWP which are common in brick & mortar not favoured by consumers. We have seen many bigger e-commerce websites promoting online instalment, but does it really work? The answer is "no" by 50% of shoppers here. It is also a myth that whether consumers opt to pay for bigger ticket size item with online instalment but the results here show otherwise with most prefer to split-pay for RM1,000 or less purchase. 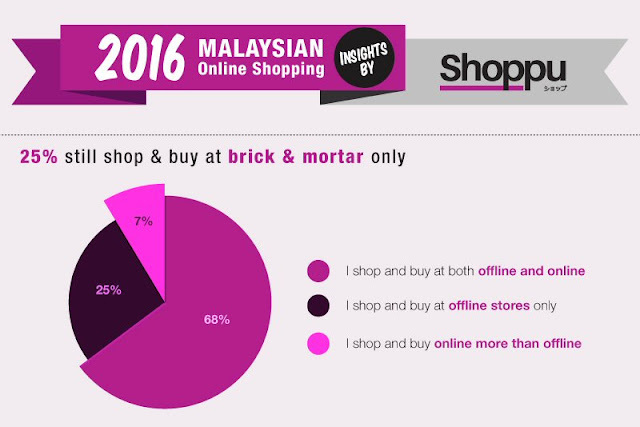 This is further proved by the feedback above that most of the shoppers who reject online instalment prefer to buy bigger items at brick & mortar stores. Even if online instalment promo is offered only minority of the shoppers will consider again on paying using online instalment scheme. For those who would use online instalment, to no surprise that the most preferred categories are Mobile & Tablets, Consumer Electronics, followed by Home & Living and Computers & Laptops. 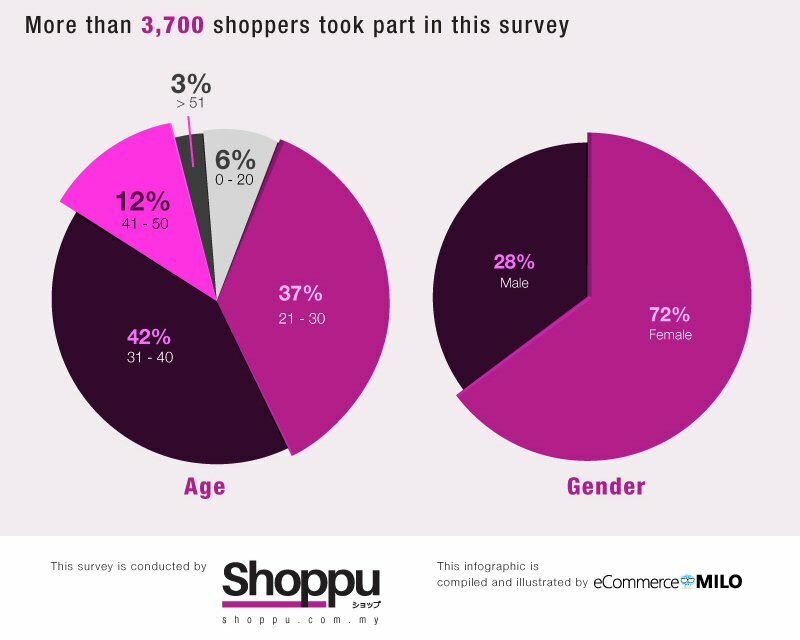 This is a sizable sample collected by Shoppu with close to 80% of the respondents are from 21 to 30 years old, and 72% of the entries are female. For full infographic, visit the pin here!